Continuing the ongoing series of interviews with creative artists working on various aspects of movie and TV productions, it is my pleasure to welcome Arv Greywal. In this interview he talks about his life-long love of movies, the various roles he enjoyed in the art department in the last two decades, the changes the technology brings to building the physical and augmented worlds we see on screen, and what keeps him going after all these years. 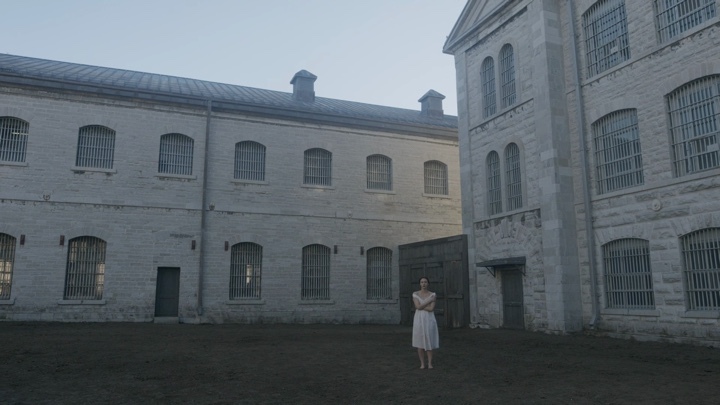 Around these topics and more, Arv dives deep into his last two episodic productions – “Genius: Picasso” and “Alias Grace”. 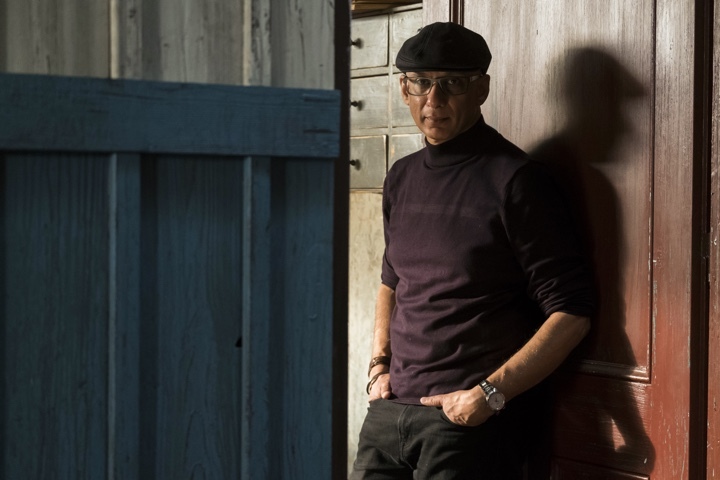 Budapest, Hungary – Arv Greywal on the set of National Geographic’s Genius: Picasso (National Geographic/Dusan Martincek). 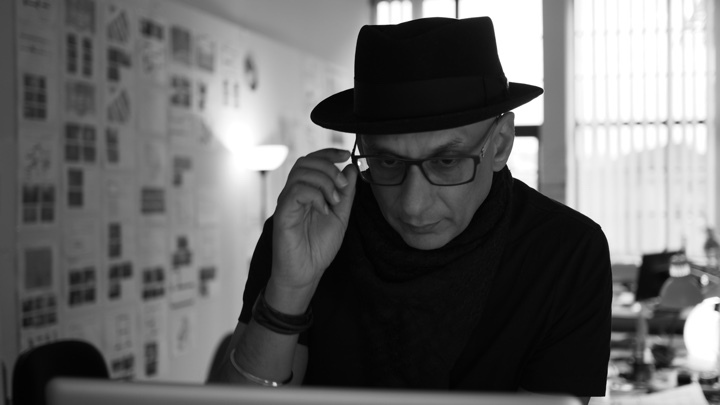 Arv: I’m Arv Greywal and I’m a production designer working in feature films and more recently in television on limited series. I grew up in Mumbai. My father was an architect, and my entire family had a huge interest in arts during my formative years. I was about nine when my dad took us to my first movie. It was “Lawrence of Arabia”, and it’s still my favorite movie. I watch it at least once a year, if not more. They played it in an IMAX theater in Toronto recently, and I went to watch it again. Still in awe of its beauty, its technical accomplishments and its power to tell an impactful and resonant story. I remember that as I was watching it, I was enthralled by the story, but I also wanted to know about how it was made. My dad got me a small book on that movie, mainly about the actors, but some back story as well. At that time, the seed for my love of movies was sown. I didn’t know how, but I could really see myself being involved in some way with making movies. My family immigrated to Canada, to Toronto and after I finished high school, I began my studies in Architecture at university. Toronto wasn’t the film hub it is today and the idea of life in film seemed distant. Yet, most of my free time during university was spent watching and learning about film, reading books and interviews by and with film makers. My favourite section of the library was where all the bound copies of old Cahiers du Cinema were kept. I finished my degree in architecture and spent the next 4-5 years in that field. Then when the recession hit in the mid-90s, architecture firms were laying off staff by the hundreds. Around that time, I was about to get married, and my wife (also an architect) and I decided to spend all our money on a 3-month trip, our honeymoon; then come back and start brand new careers. 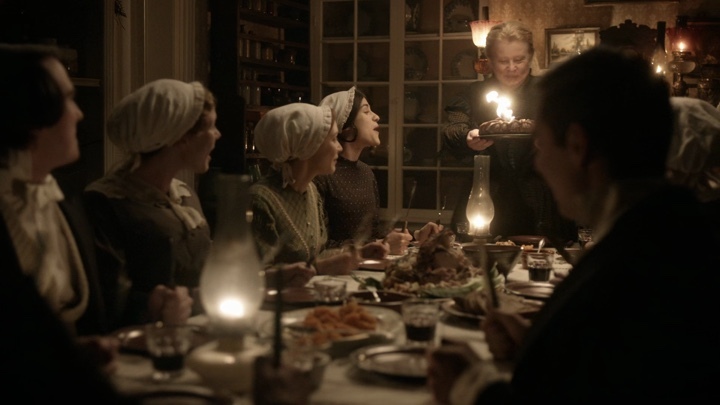 Production design of “Alias Grace” by Arv Greywal. I started sending out resumes to film production companies and designers in early 1995, and after a lot of doors being shut in my face and luckily some meetings, I finally got a job as an art department assistant on a small indie movie. It was perfect. It was the best experience that I could have had. The production designer was impressed with my work, and my ability allowed her to move some people in the art department around to other departments that were understaffed. She and I became the entire art department. We had one carpenter and one art director building things, a set designer promoted to assistant set decorator and I ended doing all the drafting, designing sets, making templates for backdrops, helping with the painting of sets, prop building, set decorating, helping with special effects, etc. It was the best job that I’d had until that point. I never went back to architecture. I worked on more movies, studios films, doing set design for a few years and then moving onto art direction. It’s an amazing job. I used to go in early every morning to check on people’s drawings and prepare for what we would want to accomplish that day or that week. We stay late after the day was done, for a drink or two and discuss the work. We worked hard and we were working on some of the biggest shows that were coming to Toronto at the time. One morning, I remember moving from table to table, collaborating and creating with my team, working with the paint and construction crew, bouncing back and forth from set and amidst all the frenzy, thinking to myself that this was the best job ever. We had fun. A couple of movies after I did Zack Snyder’s “Dawn of the Dead”, I got a call from one of the producers, asking me if I would be interested in designing a George Romero movie “Land of the Dead”. I said that I wasn’t really interested. I knew that moving into production design would get me to a more political and a less hands-on level. Luckily, I was wrong about that; since then, I’ve been able to keep my hands dirty, so to speak, negotiating the larger scope that production design requires, but also holding on to the details and doing the nitty-gritty work that just moves things ahead. Nevertheless, I declined initially, but he was persistent, and asked me to give it a try and I agreed. I did a few sketches of my ideas for that movie. Romero and the producers were visiting Toronto looking at some locations, and my interview with them was supposed to be on that Friday. I got a call from my producer friend on Friday morning saying that they were out of time and couldn’t meet with me. A few hours later, I got another call, and he said that they had a bit of time to talk at the end of the day before they went back to LA. It seemed that even though one of the producers was championing me, the other producers were not sure about it, since I didn’t have any production design experience. I went in and met with George, only as a fan. I wasn’t expecting anything out of it. I showed my sketches and talked about my ideas, and it was a very pleasant and creative meeting, but I wasn’t expecting anything to come of it. On the drive home, I got a call back. They asked me for a couple of names in LA that could vouch for me as somebody who could do this job. It was a real thrill, but the only reason I agreed to it, was George Romero. I had watched every one of his movies before that and was excited to be collaborating with someone who had single-handedly created an entire genre. That was my first job as a production designer. It’s a different animal. I’ve been doing art direction for a while, and you work hand-in-hand with the production designer for most of the day. It was a good training, and it didn’t seem totally foreign to me. But I understood the difference. Kirill: Looking back to the last 25 years or so that you’ve been in this field, what major changes have you seen in the art department as the technology continues evolving? Arv: The art department itself has changed significantly. We used to hand-draft things. We used to build elaborate models. A hand-drafted set was quite carefully considered. There were a lot of sketches and rough models made. Art department was more hands-on to give the director an idea of size and shape, laying out taped plans on the studio floors before the actual construction would start. When computers came into the art department, it was fantastic. We would build our models, and we could have a small eyepiece connected to a camera that would walk through. We’d create a Quicktime video of a full set, with as much detail as we could put into it. And now everything is done in 3D. It’s ubiquitous. All set drawings are done in 3D. Then everything is converted into a model for a walkthrough. It doesn’t take much time to layer on the materials to see how they would affect the set. Now I’m excited about 3d printers and we’re incorporating those as a part of the art department toolbox. I am finding though, that we are making a lot more changes to the sets. You can pull things, raise or lower or move them around. For me it’s better because I can be more involved and get a better feel of the set as we’re designing it. And the second aspect of it is taking that virtual 3D model and handing it off to the VFX department. They use it as a barebones model for what they need to do. I did a show called “Waco” in which we built the majority of the building. We gave the 3D model to the CG department that did the wide helicopter shots for layering the textures on top of what we’ve built, completing the full building. Even with the ubiquitous incursion of CGI, we still like to build as much as possible. Another aspect is with previz, where the directors can previsualize how a scene is going to look on any particular lens. It helps resolve a lot of problems that previously would take much more effort. I art directed “K-19: The Widowmaker” in 2002. We wanted to test with Harrison Ford with a beard. So instead of him spending a couple of hours in a chair with hair and make-up people, they came to us with a photograph of a goatee they liked. We we able to easily put it on a few frames to show them what it could look like on his face. It has come a long, long, long way since then, but the basic fundamentals are still the same. The evolving technology allows you various venues to be more creative, work within shorter timelines and explore even further the fundamentals of the job. Kirill: Looking back at your first few productions, was the “magic” of watching movies ruined for you by knowing how things work on the inside? Arv: It ruined nothing for me, and learning how things work actually enhanced it tremendously. I appreciated the beauty of movies, but I also realized that it was painstaking work to create it. When I started to discover the techniques that are used, it was that much more fascinating for me. When I’m watching a movie, I don’t really see the mechanics. If the story is good, I’m completely lost in it. It’s only on the third viewing that I would consciously look at how it was all put together. No matter what type of movie it is, if the story is good enough, it will hold you. Everything else about production design, editing, sound or costumes is hopefully part of the mix. I give this advice to up-and-coming people in the art department. Watch a movie that you really like, pick a scene or two and think about what it is that you like about it. Start to watch those scenes from various angles – from the editor’s point of view, from the production designer’s point of view, from the sound designer’s point of view, etc. You have cinematography, lighting, music, costumes and so many other things. Break it down. Look at set design. Look at the props they might have. See how all these parts enhance the whole of a particular scene. I often do this myself. When I think a scene looked magnificent, I go back to see how it came together; break it down into its parts. The biggest thing that i’ve failed to mention, of course, is acting. I do believe that we do this in service of the actors and the director’s vision of the story. Without them, none of it matters. To go back to your question, none of it was ruined for me. And movies surprise you every single day. Filmmaking is so nuanced. If I wasn’t involved in the field of visual arts, I would probably have gone to journalism or other form of writing. That’s how I approach a new movie. When a script comes to me, I read it as I read a story. I don’t trouble myself about the particular details of doing a specific scene. Once I’m done with reading, if it really holds for me, that’s when I start to break it down. We are all fans who got into it, and I don’t mean it to sound casual. Everybody is serious about it, but ultimately we do it because we love watching movies, and then we learn that we love creating film as well. That’s my approach to all of it. I still have that thrill when a movie comes together really well. Kirill: Do you have any trouble in describing what you do for a living to people outside of your industry? Arv: Not anymore. There was a time when people were not attuned to what it was that the art department does. But I think that it’s the all-pervasive role of film in people’s lives these days, and people generally understand what it takes to make movies. I don’t have trouble describing it. I think people get it. But that’s a recent thing, maybe the last 10 years or so. But at the same time, people may be getting only the surface idea of it. You need to walk in the shoes of the person in the art department – be it the production designer, art director or set decorator. And I find that even within the industry itself. There are producers, writers and other parts of film industry that don’t have a in-depth understanding of what art department does. And nor is it terrible to not have that understanding. People are often surprised by what you can produce, and that’s great. Anybody can get a certain surface understanding of what it takes to get something together. But you have to be in the art department for a few months to really understand how much effort it takes to bring a cohesive visual look together. It’s mayhem. It’s creative chaos. It’s controlled energy. You need to experience it to get a feel. Kirill: Looking at your last two productions, “Alias Grace” and “Genius: Picasso”, is it more challenging or satisfying to work on something that is not set in modern days? You get to explore and re-create a world that is no longer in our lives. Arv: It’s really both challenging and ultimately satisfying. “Alias Grace” was set in the mid 1800s; 1840’s onwards and Picasso lived for 91 years, so we follow his life from when he was born in 1881 until his death in 1973. The scope of both of these projects is enormous and it takes a lot of work to give projects like these, a cohesive production designed look. Yet, there’s so much to draw from and the goal is to take all that research and the interesting parts of all those periods and create something fresh and engrossing. One fun aspect of period shows is that since we have the ability to recreate anything we like; we aren’t really limited in any way. A small example; I can print any wallpaper that I want. I can take any image; out of book design, out of painting, even sculpture and reconfigure it into printed design for original wallpaper that feels period appropriate. We did this for wallpaper, floor tiles, posters, paintings, etc. I love doing period shows because they give you so much to work with. There’s a lot to work with on non-period shows as well. You have to strategize on how to give them a certain look. I did “Antiviral”, a micro-budget movie directed by Brandon Cronenberg. The entire art department budget was under $50K, and we had to come up with something interesting up-front because we couldn’t afford anything else. There were a few very specific machines that we had to create for the story, and we so put a lot of the money into them and simplified everything else. Our color palette was all white [laughs]. It was a decision we made and it suited the story very well. Location scouting was interesting, as we were looking to find places that would fit that palette. We didn’t want to go in and change everything. It was challenging to give the movie a cohesive feel under such restrictions, but we did it. We turned the restrictions into advantages. “16 Blocks” is another example. It was set below 14th street in New York City. Well, for a host of reasons, but mostly and usually for budgetary reasons, it had to be shot in Toronto. I wanted to make it look like a very claustrophobic, gritty and decrepit New York; as that’s the vision that began to develop in my mind as I read the script. I told the producers and Richard Donner, the director that I wanted to go to New York at the very beginning and scout it as if the movie was being shot entirely in NYC. 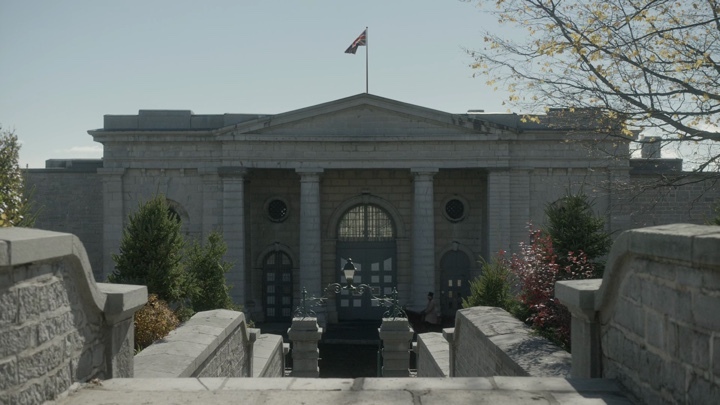 Then, I would try to match or hopefully, find a better version of that location or set in Toronto. If I couldn’t then would pencil it to be filmed to NY. This was not to exceed more than a couple of weeks of filming in NYC. The challenge was to find locations and create and build sets that enhanced or underscored the emotional life of this character; in Toronto for NY. That’s what I worked with. So regardless of whether it’s a period show or otherwise there are always tremendous challenges. You discover through the process what you have to work with and you create a world for your characters from those assets that you’ve identified. Kirill: With so many movies made since cinema emerged as an art form, there are certain cliches or stereotypes, if you will, of how movies of a particular genre are “supposed” to look like. Do you find yourself wanting to break away from these conventions? Is there a concern that if you do, it breaks me as a viewer away from the story? Arv: Yes, the generally informed audience is aware of the history of the genre and has expectations of the genre, but they also don’t want to be bored or be fed the same thing over and over, I believe; I hope. Then again, no filmmaker wants to revisit something that’s been done before, and the desired goal is always want to present something in an original and innovative fashion. That’s just the nature of being creative. When we did “Picasso”, my very first call with the director of photography defined the look of the show. He had found the photograph taken by Arnold Newman in 1956. It was taken in Picasso’s studio in La Californie. Picasso is staring deep into the camera, with the medium close-up of his studio behind him. Arnold Newman is an amazing photographer. It’s a gorgeous photo that captures the intensity of the man. 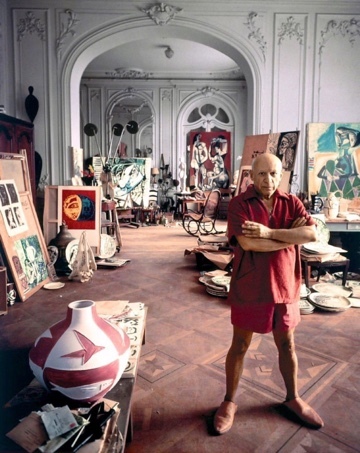 The photo had a great side light quality, with fantastic art nouveau architecture in the background, and a tremendous amount of Picasso’s life layered into the studio. And at the back of it, you see a poster for a bullfighting ring, with striking golds, reds and blues in it. It was a wonderful counterbalance to how the photo was staged by Newman. We decided that those colours in the poster would be our highlight colors as we go through the periods with Picasso and that we would draw from the details from the photograph to inform our sets and lighting. We wanted the overall feel of the entire project to be based on that photograph. Once those parameters have been established, you have a color palette that speaks to that. You have a lot of images and written text about Picasso’s life and work. As his life spans ten decades, you want to keep it from becoming too discursive. You want to have that cohesion, and that’s where the production designer starts to look at it. You want to be as accurate as possible, at the same time, you also want to give depth to the scene. You want to heighten the emotion of the scene. You want to find the crux of it. You want to amplify it. There’s a level of hyperbole that you get to, because you want to magnify the tenor of the scene. I look for that when I’m thinking about how to create a certain set. What is at the core of it, and how does my production design strengthen it? It’s a fine line. You don’t want to get into somebody’s face with it. You don’t want to take them out of a story. You don’t to be inaccurate about it. And yet you don’t want to present a cliche. You want to make something new. It’s a case-by-case approach to each set and each scene. My assistant will prepare a list of all the scenes, and as I read through them, I put aside a few to look at them closer. What is standing out to me in those scenes? How can I enhance the set using the director’s vision? I work closely with the director, the director of photography and the costume designer. The decisions that the costume designer makes about colors and textures have a big bearing on my work. It goes back and forth in prep. It’s a wonderful flow between these 4 or 5 people, as the writers aren’t usually available to us. Once you get to that point, the idea of cliches or stereotypes in genre is non-existent, because you’ve created something from within and if you’ve done it honestly and with diligence, then the audience will buy into it and you’re well beyond breaking the viewer’s trance. 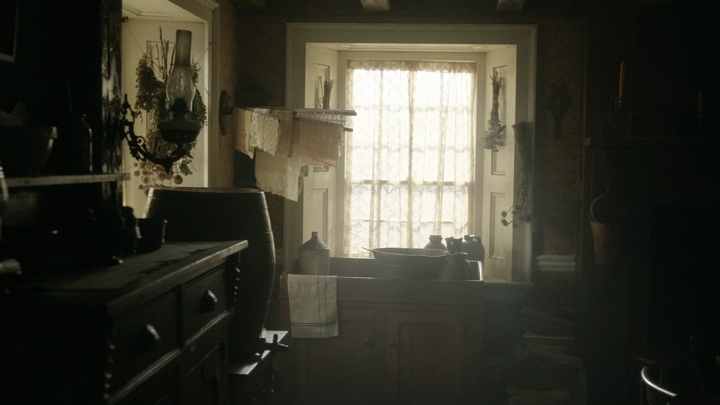 Kirill: If I bring you back to “Alias Grace”, it was six episodes with the same director, the same cinematographer and the same production designer. So it was, perhaps, a super-long movie from that perspective. Arv: I absolutely prefer that. It’s hard to call these productions TV series these days. It brings up connotations of the traditional network shows. “Alias Grace”, “Waco” and “Genius: Picasso” were far from that. Having the same director maintains the same vision all the way through. The vision is mostly set by the show runner, but there’s cohesion to the execution. Before “Alias Grace” the only TV I had done were 3 or 4 pilots, always with feature directors. They were fantastic to work on because the work was so intense. I’ve sort of shied away from doing actual series after the pilot was picked up. But when “Alias Grace” came around, it was different. I had worked with the director Mary Harron on “American Psycho” before. We had a wonderful meeting, and we were really in sync with each other. Sarah Polley has written the script, and I have always admired her work. As you say, it was the same writer that had written the entire script, the same director and the same cinematographer. It worked out like on a feature film. When we got on a set, we would shoot that set completely A to Z, and be done with it. On “Waco” we had John and Drew Dowdle writing all the episodes with John directing four of them, and Dennie Gordon directing the other two. It was pretty close to how we did “Alias Grace”. But we were going back and forth on the same sets every other episode. It boggled me a little bit. Why can’t we just shoot the entire thing? You learn though, that there are so many different variables – actor availability, changing directors, financial considerations. All these things that shouldn’t affect me as the production designer end up affecting me in a way. You have to keep continuity, you want to open the set every time it’s revisited, you want to ensure that the director is happy and comfortable with it and that nothing’s changed in their mind since the last visit, etc. And there are occasions where you build the set twice, because it’s cheaper for you to do a small piece of that set somewhere else. It becomes a bit broken up in that way, and requires more effort and tracking to keep it together. We did “Genius: Picasso” with five different directors, two episodes each. That became the same thing, but on steroids. You’re moving closer to how traditional TV is done. 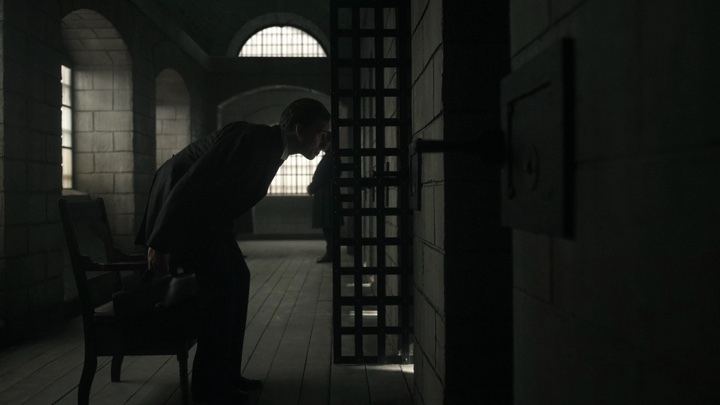 The cinematographer was the same throughout, and he directed the last two episodes, which was fantastic. The show runner was there almost all the time, laying down a uniform idea of how the show was done. But my preference would be to shoot it as a feature with a single director. You can’t do that on a show like “Picasso” because you have to get it out there in a fixed amount of time. You need to do editing, and the directors move on. It’s taxing to be directing six or eight episodes. I recently saw “Godless” that had seven episodes. I think it started with six, and they stretched it for story reasons. Scott Frank was brilliant. He wrote and directed it all, and I thought it was beautifully done. It was enthralling to be brought into that world. I’m hoping more directors would do that; direct the whole thing by themselves, and it would be great to be a part of it in that way. There’s one thing that happens when you have multiple directors doing two-episode blocks. I’ve prepped for 10 weeks, and we’ve already built our major sets that will be there throughout all the episodes. Let’s say that we’re filming episodes 1 and 2. Now I need to start prepping with the director of episodes 3 and 4, while they’re shooting 1 and 2. So my time is divided between those two directors. I have to make sure that every day I’m present to open the sets for 1 and 2, while also prepping for 3 and 4 with that director. “Picasso” was different from most of the shows. There were a lot of seemingly small scenes, something like 1/8 of a page sometimes, that described huge sets. Sometimes we would move 3 or 4 sets a day. One day we did 7. I want to be there at the top of each day when they come in to those sets. Of course, we discuss it all beforehand, but when the camera gets there, things change. Directors want to change angles or lighting or blocking or any number of things. When you work with multiple directors on the same show, your time is divided. Sometimes you know that you need to be there, but you also have to do this other thing. It’s a bit relentless. Kirill: How much was done with digital extensions on “Alias Grace”. Is it usually down to financial considerations of how much it would cost to build physically vs in VFX? Arv: There were only about a dozen digital extensions done over the course of six episodes. Our VFX supervisor and his teams did a fantastic job. The main reason for us to go digital was to give a greater sense of the world we were creating. We constructed massive physical sets to accommodate the action, in camera, but then there are times when you want to open it up some more. 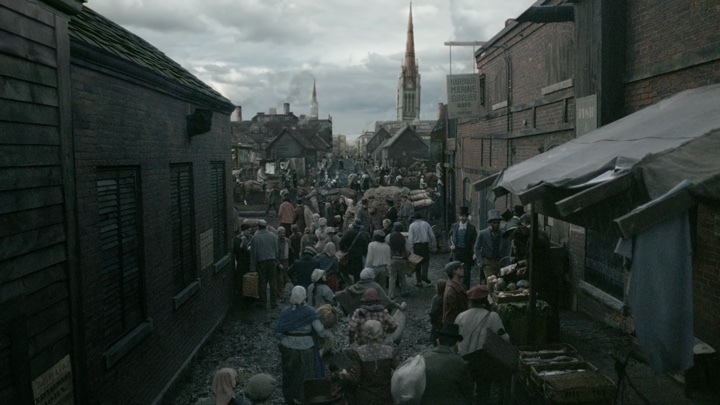 We wanted to give the audience a larger understanding of what Ireland and Toronto looked like in 1840s. I also wanted to use set extension to juxtapose this young girl and her small life against the backdrop of a much larger world, that’s very foreign to her. In my research, I went to the Toronto archives to find maps of that era, and found beautiful maps of the period with these little vignettes of the city sketched on the sides. There were some lovely details of city life, and larger bird’s eye views of the city. I showed them to our director and the VFX supervisor, and suggested that we should be looking for opportunities to feature a live action version of them. Going back to the perceptions that we talked about, you want not only to show it, but also to enhance it to the point where it’s new and reveals something that the audience previously may not have had a good understanding of. It gives them context also. One particular scene comes to mind. When Grace Marks first comes to the Toronto Harbor, and walks through the muddy, disheveled, broken-down path among between the shacks and crooked old wooden dock buildings, among the First Nations people, sailors, fishermen, fishmongers, and immigrants, it’s really a foreign place for her. Then she comes out to an open area, and as the camera comes up, we see the rest of the city. That was a brilliant moment for us to use set extension. We found a location that we could build into, and create that muddy boardwalk. We built the dock, but there were no ships, because we built it in a parking lot [laughs]. The ships were digitally added, drawing from those maps and other research. Our digital crew did a beautiful recreation in post. 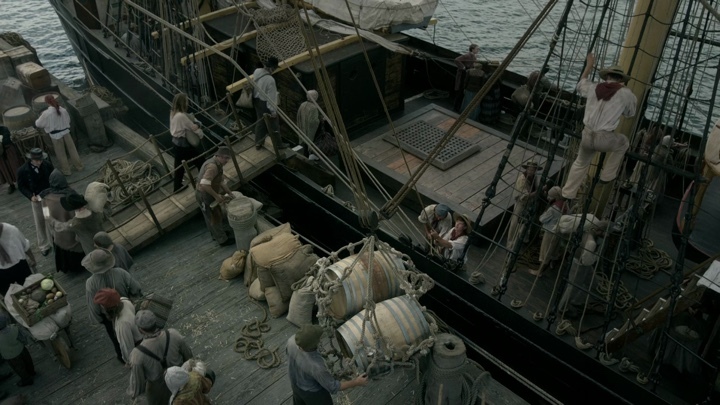 We started off the arrival of the ship and onto the dock with greenscreen behind the actors and about 100 background performers, to show the ships in the water and give a large view of Toronto Harbor. Then Grace walks with the throng of new arrivals through the dock area down to the customs. There were so many sick people coming off those ships, that we built a rough hospital triage to add to the hubbub of activity. There were people hawking their wares, people scamming others, all of this life coming through. As she passes through what was about 150 yards area with disheveled shacks, we opened it up at the other end with horses and carriages, more city like activity, and large green screen behind where the camera would rise up and show Old Toronto. Basically we bookended it with VFX and physically built the middle part. I think it gave a powerful entry into the new world, showing her state of mind and her fear. She’s coming into this new place. There’s the enormity of it, and also the effect that the ocean voyage has had on her when her mother died. Whenever we’re doing VFX, there’s always a physical build. We want to push it a little bit further on. Another example of where your idea of financial considerations is a factor is the prison set where Doctor Jordan first comes to visit Grace. We built a section of the interior of the jail. It was a long corridor with cells off it and in keeping with the period, had very high ceilings. We looked at historical documentation and sketches of the prison where she was incarcerated, and saw that the corridors in Kingston Penintentiary (her prison) typically had barrel vaulted arches. That was one place where I asked the director and the VFX supervisor to agree to do a digital enhancement. The thinking was that we would realistically only see this great ceiling in only one or two shots and the amount of money that would be spent to build it physically could be better utilized elsewhere. There were lots more digital touches here and there; sometimes enhancing, sometimes removing things. You don’t even know. It looks like a physical build. This is what I love doing – create worlds that look real and utilizing all the tools available to accomplish this. Kirill: How much work went into creating the various parts of that penitentiary? Arv: I was talking about the cell she was held in, and the corridors outside of it. That set probably took 4-5 weeks to build, with 20-30 people working on it. 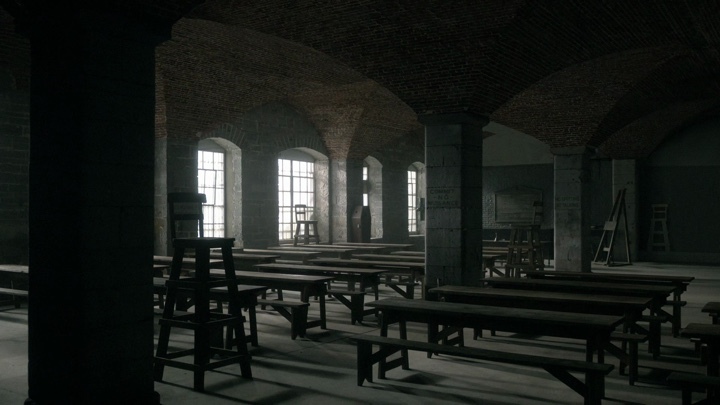 Kirill: You also have the dining hall, torture rooms, the chamber with the staircases. Arv: These were done in the actual location. Of course, we wanted to depict it all in an historically accurate manner. We received permission to use a condemned part of the prison, that was built around the 1840s, and was used for over a 100 years; so it had been retrofitted over various periods. We stripped away the modern pieces, things like fire safety equipment, heating pipes, radiators, doors, signage, etc. and replaced them with older pieces; covered over walls and floors that were constructed with modern materials. Then we recreated every stick of furniture and hand painted all the signage that we installed. The dining area needed a bit of CG help. If you look carefully, we’re only shooting into one side of it, as the other side of the room is completely modern. We changed all the windows that you’re looking into and as I said before, took it back to its period. The same went for the torture hall. We were basically shooting into a corner of two walls. 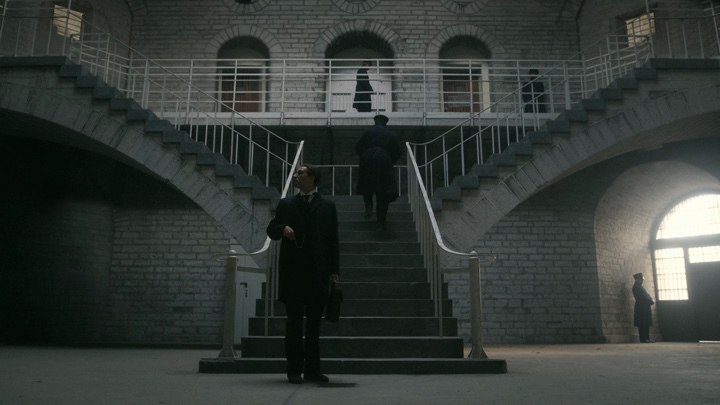 The actual prison location is a good example of collaboration between cinematography, production design and VFX. We took something old that was upgraded over a hundred years of its usage back to its original state through work done by the art department, the VFX department and camera. Nice to see that collaboration give life to a set. Kirill: Is it a bit disappointing that if you do your job well, it’s almost invisible? Arv: I don’t think it’s disappointing. It’s every production designer’s nightmare. I’m joking, but it is often a fact that you do a great job, and people don’t realize what you’ve done. I did a movie called “Hyena Road” with a director who’s a good friend of mine. It was set in Afghanistan, but we filmed part of the movie in Shilo, Manitoba in Canada, because that was our only access to specific military vehicles called LAVs – light armored vehicles. For a host of reasons these vehicles couldn’t come to us. The Army would let us use them for a day or two, between their training exercises and maintenance schedules. So we built the Forward Operating Base that was supposed to be in Kandahar Province in Canada and the Afghan Village that was crucial to the story in Jordan. It was a significant build that was to be blown up with rockets at the end. We did it adobe-style, with rough framework using local and Egyptian workers who came together to build it out of mud bricks. When we were screening the movie at the Toronto International Festival, people were coming to us and asking where did we find these locations, specifically that village [laughs]. They were saying that it was amazing that we got to blow up a section of it. The director just kept saying that it was an old abandoned village we found. It was all tongue in cheek, but I also think part of it was that he didn’t want the magic of it to disappear for people. People think that we just go and find these things. I have another example, and I think that the director was quite right in his reasoning in this case. I was on set on “Cosmopolis” with David Cronenberg, and we had taken apart this old dry cleaning place and turned into a little, dingy cafeteria for cab drivers. It was a beautiful location that was looking out onto a street that we wanted to use quite a bit for some action sequences. The interior was chosen and created because the view outside and the exterior worked perfectly for us. At the top of the day, Robert Pattinson, who played the main character came in and was just having a look around. He came over to me and asked we changed much at this location; but before I could answer, David spoke up and said, “No, we just find these places.” I saw what David was doing. He didn’t want to take the actor out of character with stories of how we created that set. The set must be real for the actor. So no, I’m not disappointed in this. It’s part of creating that magic for the movies. I know what I’ve done, and I know that people don’t always know what I’ve done. Another aspect, beyond your work being invisible, is that you create an entire world with your sets, but it’s up to the director and the cinematographer and, eventually, the editor to decide how much of it we’re going to see. As a production designer, my job is to build the most fertile playground for them to create their story in. It’s up to them to use as much of it as they want to. It’s their part of the job. The set is not mine to hold on to forever. Once the crew gets on, it’s their set. It belongs to the director, the cinematographer and the actors. I always say that we’re lucky if we’ll see 30% of it [laughs]. There is a pang of regret where you wish that the wide shot had held a little bit longer, but it’s all in service of the story. It’s the director that is creating that story, and you want to leave it up to them. Kirill: If I’m looking at the two main households where Grace serves after leaving her family home, where those existing locations that you took over? Arv: I’m very proud of the second, countryside location. We surveyed quite a few houses in the rural Ontario countryside, looking for a perfect farmhouse exterior. There are so many different characters and homes in the story that I wanted the house to express the owners character. For this one character, I felt a stone house would be right. We found a beautiful house and it had a magnificent drive, but it was too small. 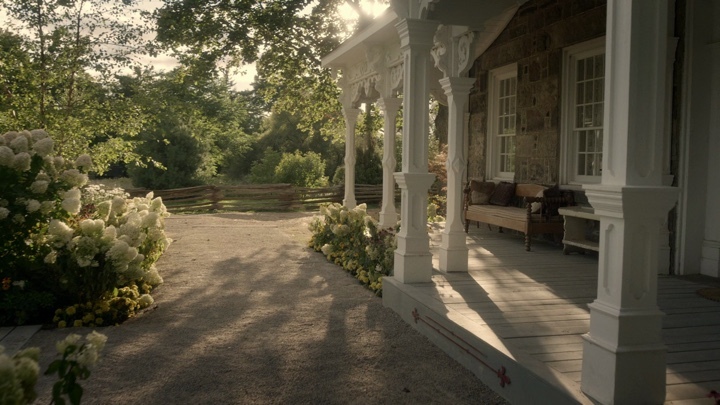 We had some scenes that were happening on the porch, and my thought was that a small porch was not going to work. It wasn’t big enough to project that level of strength of the character that I wanted either. Then we found another big, beautiful stone house that had no porch at all, and no front garden to speak of that would make sense for the action scenes that we needed. But you could film it beautifully from various angles. I decided to use that second house; we built a massive porch out of steel, and clad it in wood. The lovely people who owned that house agreed to let us tear apart their stonework in front of their house so that we could put our porch in place. We built the porch in three pieces in our construction shop, it was delivered to the location via flatbed trucks, and we then craned it into place. We created the landscaping around it. We created the gravel road that came all the way up from the front path. We built several outbuildings to define a back area of the house. Ultimately, we ended up using only two rooms of that house. Those rooms were, of course, modernized. We changed the window mullions. We added wallpaper and changed lighting. We added fireplaces, and one of them was a working one since we were lucky to have a flue. Attached to the back of the house, but standing entirely on its own we constructed a summer kitchen. The kitchen led out into the garden area, and we built all the garden structures as well. It was a tremendous amount of work to go to that location and completely convert it. You’re using some of its bones, and you add more bones and flesh to it. There was one scene where Grace walks all through the rooms of her master’s house. We had to find cutting points to piece this walk together because had the porch, the parlour and main hallway and the back summer kitchen built into and on location, along with the stairs that went down into the cellar where the murder takes place. We built the winter kitchen, all the bedrooms and the murder cellar on separate parts of the stage. And it all had to come together in one undisturbed walk through the house. It was a wonderful mix of stage sets, location builds and the location itself. Kirill: It’s interesting to see how the lines between feature films and episodic TV are being pushed and blurred in these kinds of productions. And on top of that, you can watch these stories on so many screens in our lives. Perhaps it’s the evolution of storytelling as art, where some stories get a couple of hours, some get six, and some happen to be ongoing. It also gives the opportunity for deeper explorations of specific stories. Do you see more scripts coming in that are not happening in the world of feature film? Arv: Definitely. I’ve only done television in the past two years. Before that I did a few pilots that I’ve mentioned, but otherwise it used to be only features for me as an art director and production designer. I’m quite excited about this open-ended idea of storytelling. I’m happy that I got to work on “Picasso”. You take a life that stretched over 90 years, and you give depth to the story of what that life was like, compared to a 2-hour movie. That is not to say that you can’t do it as a movie, and there have been a couple that have been fantastic, but I think with the longer format, we did a pretty amazing job drawing the viewer into what that life was like. I think that people want that more and more. I know that I, as a viewer, really like it when I can see different parts of that world. I just saw “Sacred Games” which is a 10-part series from India based on a cop’s life in Mumbai. It was the most fascinating thing for me, and I don’t think I would have seen that if it wasn’t for platforms that present it like they do, letting the story go on for a while. People are trying to see different things in different ways. People are trying to experience different worlds. I’m all for the different ways to experience those stories. My job doesn’t really change. My idea of how I approach production design stays the same. It’s the same basics. It’s the same heart and soul to it. It’s the logistics that are different based on the format. Kirill: When you consider doing a production, do you look to have your sensibilities be aligned with those of your major collaborators? Arv: I don’t think I’d get the job if some of my ideas and opinions about the show didn’t align with those of the director. If we’re completely in conflict, I’d probably not get that job. At a certain point, you will have different opinions; it’s inevitable . It’s your approach that’s going to determine whether you’re going to be successful in getting that idea approved or not. If you present your idea in a manner where the director can see how it fits within their vision of the film, then you’re going to have some success. It’s never really so, succinctly defined. You have a dialog. You want to come to an alignment of sorts with the director and the cinematographer. That triumvirate is important. Those three people are usually looking at locations and determine the look and shape of sets. You also have VFX becoming part of these discussions more and more now. Kirill: It’s amazing to think how many people it takes to bring one of these stories to life, and how many things need to be aligned to make it work. If, perhaps, just one of two things are off, the whole story feels off. Arv: There are times where you have given it your best shot, and the project doesn’t quite do what you expected it to. That happens. You know that everybody has put in their best effort, but it just didn’t quite gel. There is this alchemy that happens when it comes together. A bit of magic to. That’s what draws a lot of people to this art form. Kirill: You’ve talked about so many of your productions so far, and it feels like you’ve held on to these small details for each one. Looking back at some of those that happened a few years ago, what stays with you? Do you remember the good things, the bad things, or some mix of the two? Arv: This is going to sound totally false, but I don’t think that I’ve had any terrible experiences in my projects. There are a few instances that I wish had gone in a different direction, but those were small moments within a project. Working in the industry been a very positive experience for me. It sounds cliched, but I think that’s what every production designer would tell you. We work hard, and the work is rewarding. Every project feeds into the next one. I do often go back and take a look at stuff that I’ve done. Sometimes it makes me cringe, and sometimes I think I’ve done a good job. You see how your past work enhances and informs that next thing you’re doing. You experience new and different things. “Alias Grace” was done in Toronto, but most of my work for the last 10 years has been in different parts of the world. I’ve worked Thailand, Jordan, Malta, Spain, Hungary etc. I’ve also done a backlot build in Sofia, Bulgaria that I spent a year working on. It’s fantastic to go to different places and create an art department with local talent that is going to make something new. I look back at every project that I’ve done, and see that I build on it in a positive way. To get back to answer your question, sometimes you look back and you see a negative experience or two. But they turn into positives, because you draw on them and you see how you can make it better. Generally, I try to look for the positive in every aspect of filmmaking, and think about how we can make it better the next time we do it. Kirill: You almost answered my last question, which was about what keeps you going in the field despite all the pressure, and being away from your family and friends. Arv: It is the fun that I’m having. There is an enormous amount of pressure [laughs], and it’s quite taxing. But when you’re doing it, you’re have a tremendous amount of fun. You develop a camaraderie when a film company comes together as a group. The art department comes together as an intense family, and you’re having fun with the people you’re working with. It’s a creative field, and you’re building on things. That part keeps me going over and over. If I’m traveling somewhere, it’s wonderful. My family comes with me for as long as they can. When my kids were little, they would come with me for big chunks of the show. Luckily, the projects I’ve worked on were of a nature where I could bring them along for extended parts of it. It’s extraordinary to have them travel with me, and at the same time to experience new places myself. 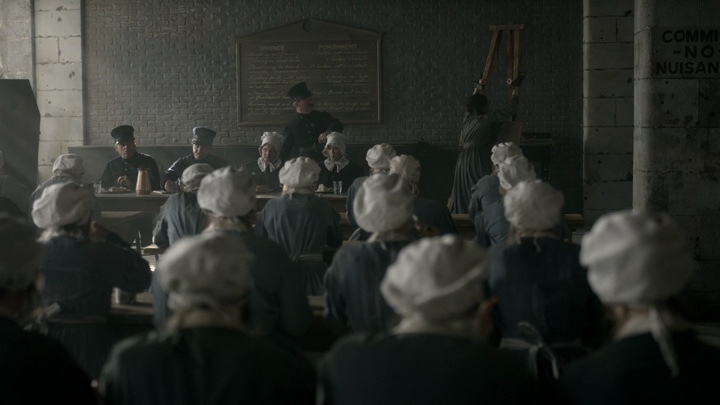 And here I’d like to thank Arv Greywal for graciously agreeing to answer a few questions I had on the art and craft of production design, and on what went into creating the worlds of “Alias Grace”. The show is out now on DVD, as well as in digital formats.